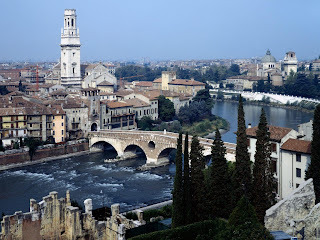 About two hours drive from Milan, Italy, you will arrive at Verona. The city has long been famous for fictional love story of Romeo and Juliet Shakespeare. Due to the global fiction Shakespeare, Verona became the fourth city of the most visited in Italy. Each year, about 1,600 of the Japanese tour group stopped for an hour before continuing the journey. In Verona, they usually visit the House of Juliet to see a small yard that looks as romantic love story wrapped Romeo and Juliet. Visitors from around the world usually take photos on this page. 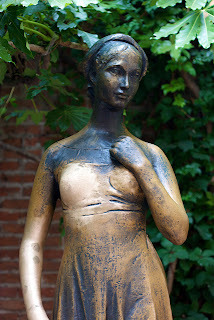 Balcony of the building and a bronze statue of Juliet is a favorite place to pose while hoping for luck in romance. Although the story of Romeo and Juliet is a romantic fiction, but the city is packed with authentic history. Because the ancient Romans considered Verona as an ideal place to rest before crossing Alpen, the city has a wealth of Roman ruins. In this city, you can find a Roman amphitheater in the world's third largest from the first century AD. Amphitheater is also home to the summer opera festival in Verona. Other places are also drew Corso Porta Borsari is one of the elegant shopping area in Verona. Here, you can walk around while looking at the remains of Roman, medieval reliefs, and the beautiful old facade are scattered among the luxurious shop windows. Corso Porta Borsari from, you can move on to the Piazza Erbe, Verona market square. This place has become the location of associations of people since Roman times. Now, Piazza Erbe is a relaxing place for local residents who began their evening with an aperitivo (a type of alcoholic beverage is usually served before the start of a meal). Piazza Erbe is also a gathering place for young people who used to Verona bar-bar fill. In addition to bar, Verona also has restaurants are very good. One that can be visited is the Enoteca Can Grande. Another interesting highlight of the evening Passeggiata Verona (a night). Wide sidewalk in Verona lets you see the great city views and lifestyles of young people there. When walking, you will also find a little love stories, romantic. For example, you'll see a man on a bicycle handlebar which sit between her boyfriend hugging him. Romance love in Verona can catch you when traveling to this city with your partner while keeping in mind of course the love story of Romeo and Juliet.